The best accommodation package . In order to assist with the early morning start, why not include accommodation the night before your flight just 5 min walk to the take off area and also to a walk distance to the historic city of Segovia? Arrive to your Hotel after 1 PM for your check in and enjoy a romantic visit of Segovia. In the morning your dream will become true , fly in a Hot Air Balloon. After your flight, return to your hotel with time for your check out. Ahead of you all the day along to continue your visit of Segovia and come back to Madrid with plenty memories of 2 amazing days with your love one. This is the better value package to fly in a Hot Air Balloon and Visit Segovia. Drive by yourself to Segovia and make your check in at Hotel Corregidor, 2 ** SUP . Bus station is just 50 meters walk from the Hotel, if you prefer come to Segovia using the public transport from Madrid. Parking for customers is available, so from now on you can relax and enjoy the next two days in a Medieval City. Hotel Corregidor has been recently renovated. All rooms have excellent views to the Cathedral of Segovia. Free WIFI, Air Conditioner, Complete Bathroom , TV in all rooms. After your check in, enjoy a lovely walk around the streets of the historic centre. Hotel Corregidor is situated only 4-minute walk from downtown and the Great Roman aqueduct. As you discover by yourself why Segovia is a UNESCO World Heritage City you will find dozens of restaurants for lunch and dinner with local and international menus available. Next morning, wake up early in the morning only 5 minutes walk of the Hot Air Balloon take-off area, meet the team and watch as the balloon inflates. After a safety briefing, step inside your balloon’s basket and take to the skies with your pilot. Each basket holds a maximum of eight people, and there’s plenty of room for you to see the sights comfortably as you soar up and away. Have your camera ready to capture bird’s-eye views of the Segovia Cathedral, the medieval Alcázar of Segovia castle, the Ancient Roman aqueduct, and other marvellous sights. 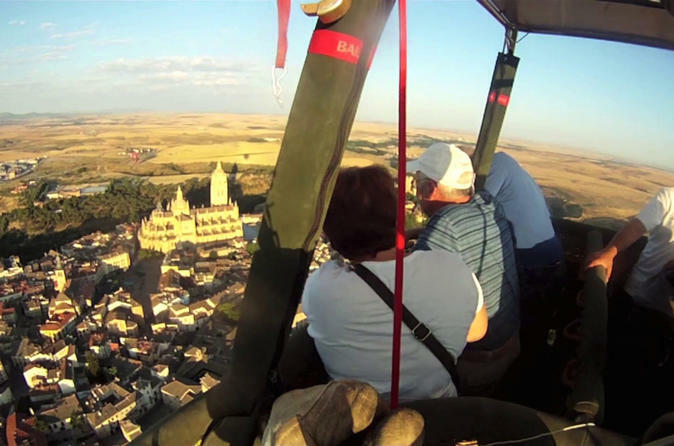 As you go, your pilot will provide context and tell stories about the city’s landmarks, including the story of Segovia's UNESCO World Heritage status. After floating through the air for an hour, you’ll return back to Earth with a gentle landing. From there, it's time to celebrate your flight with a glass of local Spanish champagne and a traditional Spanish meal, including Serrano ham, Manchego cheese, chorizo, and other delicacies. After breakfast, you’ll receive a special flight certificate from your pilot. Your experience finishes at the launch site in Segovia. * FROM 1 pm(the day before your flight). Check in at the Hotel Corregidor. Enjoy your day at Segovia! *07.00 am (approx).Meet our Pilots & Crew at the take off area. Meeting times are confirmed on booking. * 08.30 am (approx).Landing. Hot Air Balloon pack-up games and lots of laughs.